This is a sponsored post on behalf of Boxpark. 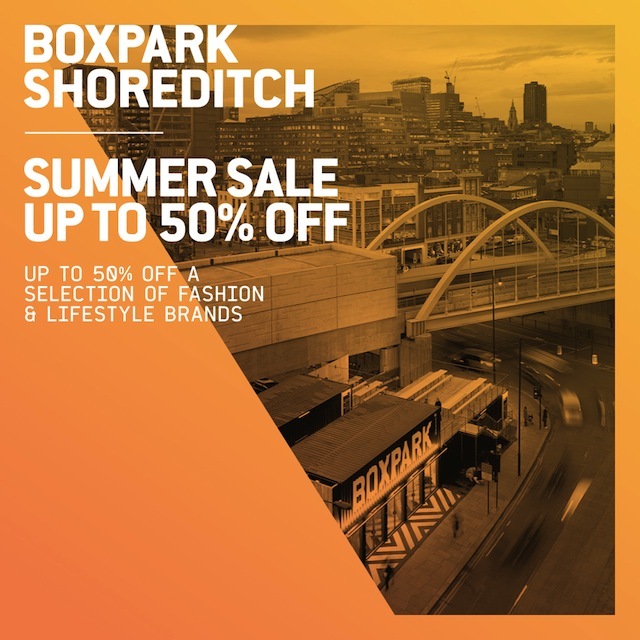 This weekend, the Boxpark Shoreditch Summer Sale kicks off with up to 50% off across a selection of brands. Get kitted out for the season at fashion stores such as Farah Vintage, Vans, Melabelle and Marimekko, or prepare for alfresco summer adventures with outdoor apparel from The North Face. Head to the Upper Deck for food and drink from outlets including Cottons, Simply Fish, Chop'd, Pieminister and Bukowski. Cool down with a Taiwanese bubble tea at Milk Tea and Pearl, or if summer hasn't been warm enough for you then heat things back up with Thai and Lao Street Food. Sunday also sees the return of BeatBOXPARK with top beat boxing talent from across the country. Grab your discounted purchases and bubble tea and watch the beat boxing battles unfold between 1-4pm. For more information about Boxpark visit the Boxpark website, like Boxpark on Facebook and follow @Boxpark on Twitter.